A 1-month-old female presented to our institution with a history of poor feeding, diarrhea and a 2-lb weight loss. Upon evaluation, the patient was determined to have severe dehydration, acute renal failure, and metabolic acidosis. Cornelia De Lange syndrome was initially suspected by the geneticists due to dysmorphic facial features, including prominent eyebrows, thin upper lip, and smooth philtrum. 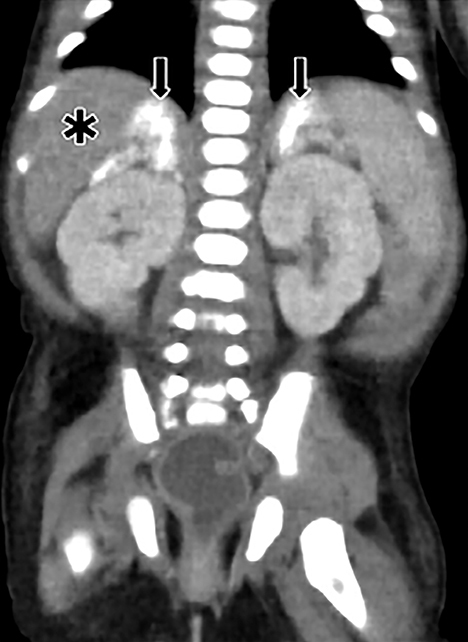 Imaging revealed bilateral adrenal enlargement and calcifications with maintenance of the adreniform shape. 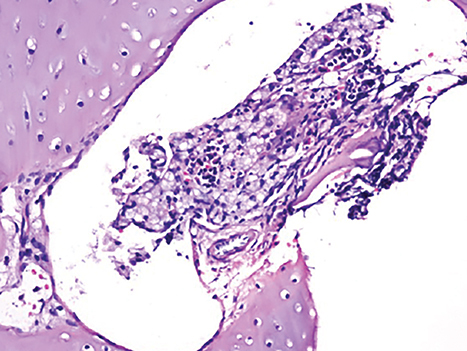 Bone marrow findings and genetic tests were performed and confirmed the diagnosis. 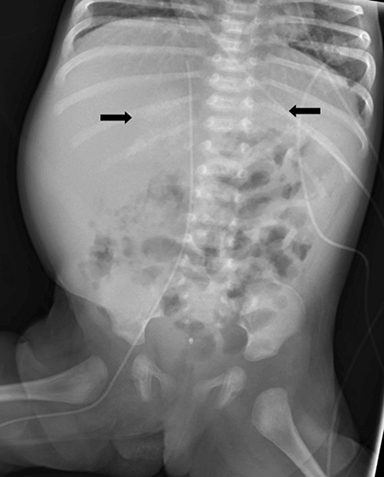 Initial plain radiograph of the abdomen for catheter placement demonstrated dense calcifications in the region of the adrenal glands (Figure 1). 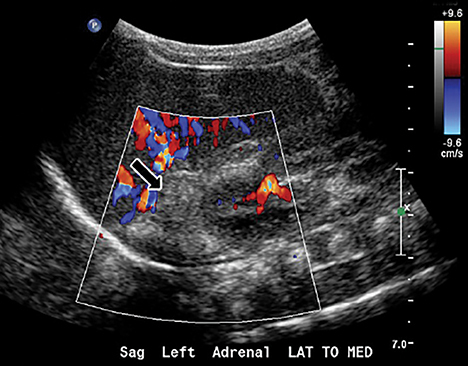 Subsequent abdominal ultrasound showed bilateral enlarged and calcified adrenal glands (Figures 2 and 3) which maintained their adreniform shape. 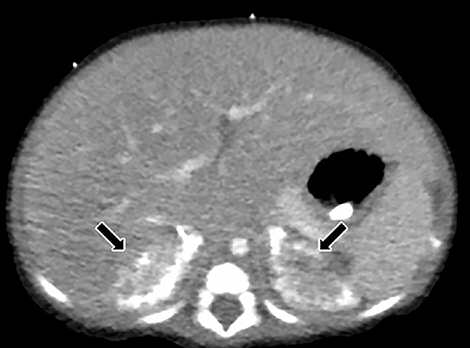 A CT scan of the abdomen and pelvis with and without contrast showed bilaterally enlarged calcified adrenal glands, hepatomegaly with fatty change, splenomegaly, and mild ascites (Figures 4-6). 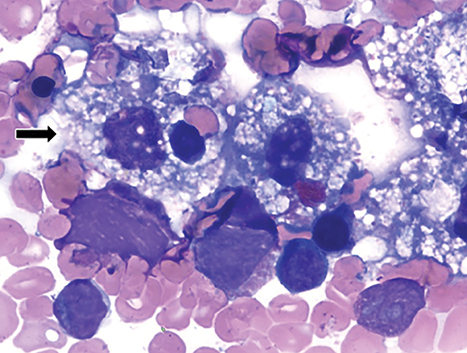 The differential diagnoses include neuroblastoma, ganglioneuroblastoma, adrenal hemorrhage, granulomatous disease/infection, lymphoma, and adrenal carcinoma. Clinical symptoms are nonspecific and can include vomiting, steatorrhea, failure to thrive, poor weight gain, abdominal distension, and abnormal neurological development. 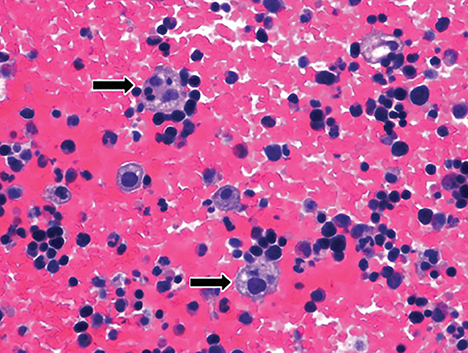 Hepatosplenomegaly can be seen due to lipid accumulation within these organs, although lipid accumulation is widespread. Interestingly, it is usually the adrenal glands that are solely calcified, with sparing of the adrenal medulla. 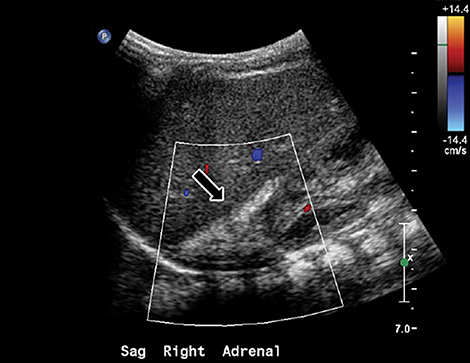 The differential diagnosis for adrenal calcification is extensive. A distinguishing feature that favors the diagnosis of Wolman disease includes uniform bilateral enlargement and cortical calcifications. Other conditions that cause adrenal calcifications result in: a) decreased or normal size (adrenal hemorrhage or granulomatous disease), b) variation of shape and size of the adrenal gland, c) or adjacent renal displacement (tumors). Wolman disease is almost always fatal in the first year of life, with malabsorption and diarrhea representing the main cause of demise. Widespread lipid accumulation can lead to multi-organ failure. Treatment is focused on reducing specific complications. A fatty-ester-free diet may help with steatorrhea. Bone marrow transplantation has had mixed results. Wolman disease is a rare condition that affects neonates due to an inborn error of lipid metabolism. 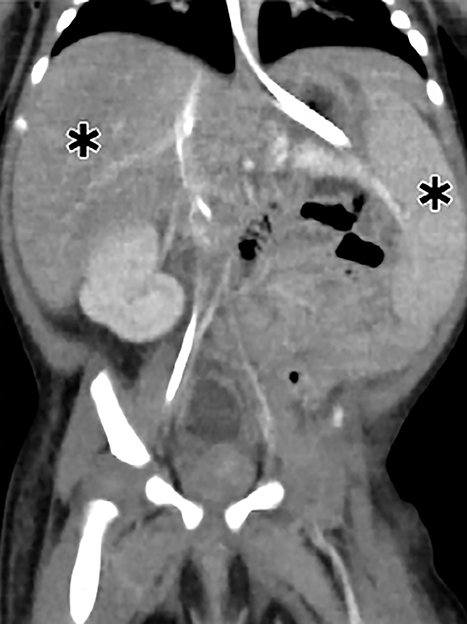 Radiological findings of bilateral adrenal enlargement and cortical calcifications with maintenance of the adreniform shape are pathognomonic. It is important to recognize the disease because it is often fatal in the first year of life. 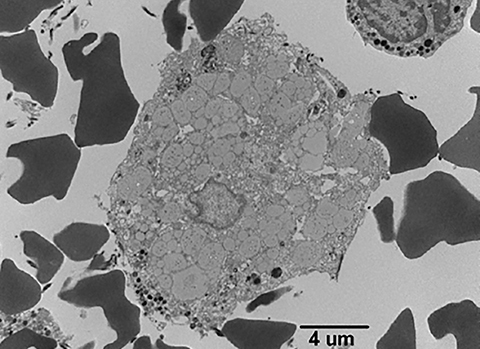 Wolman M, Sterk V, Gatt S et al. 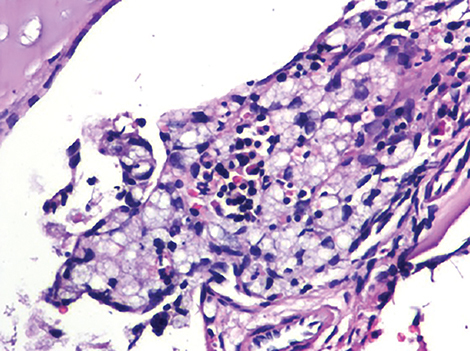 Primary familial xanthomatosis with involvement and calcification of adrenals: report of two more cases in siblings of a previously described infant. Pediatrics. 1961; 28:742-757. Anderson R, Byrum R, Coates P et al. Mutations at the lysosomal acid lipase/cholesteryl esterase (LIPA) deficient in wolman disease to chromosome 10q23.2-q23.3. Genomics.1993; 15: 245–247. Nchimi A, Rausin L, Khamis J. Ultrasound appearance of bowel wall in wolman’s disease. Pediatric Radiology.2003; 33:284-285. 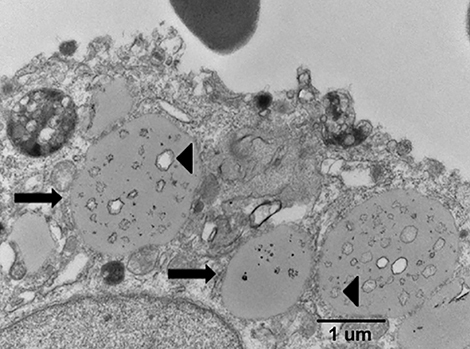 Reiner Z, Guardamagna O, Nair D et al Lysosomal acid lipase deficiency – an under-recognized cause of dyslipidaemia and liver dysfunction. Atherosclerosis. 2014; 235: 21-30. Dutton R. Wolman’s disease ultrasound and CT diagnosis. Pediatric Radiology. 1985;15:144-146. Low G, Irwin G, MacPhee G et al. 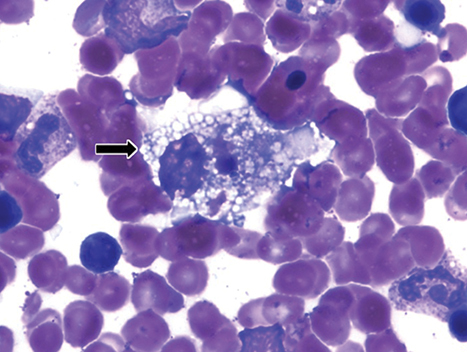 Characteristic imaging findings in wolman’s disease. Clin Radiol Extra. 2004; 59:106-108. Ozmen M, Aygun, N, Kilic I et al Wolman’s disease: Ultrasonographic and computed tomographic findings. Pediatric Radiology. 1992;22: 541-554. Prepared by Dr. Dao while a Fellow, and Drs Mandell, Jorgensen, Patel, Southard and R. Towbin on the faculty, at Phoenix Children’s Hospital; and by Drs. Jacobsen and S. Taylor while in the Pathology Department at PCH; and by Dr. A. Towbin, while a faculty member at Children’s Hospital Medical Center, Cincinnati, OH.